Do you remember “Mary, Mary, quite contrary?” This children’s nursery rhyme represents an archetype of human behavior. A contrarian is a person who bets on the opposite of the conventional wisdom. We really ought to be doing one thing — but very often our intuition or our perverse inclination is to do another. The habit can get us into a lot of trouble, interfere with our progress, even keep us poor. Run proposals through your contrarian mind and dream another way. Help yourself and others to see the possibilities. That’s what we’re paid for. Follow the will of your willful mind. It often takes less time, gives more satisfaction and better results. Know that what you’re doing wrong is your style. Wrongness is precious. Watch for it, understand it, and keep it up. At those times when the conventional wisdom is to be unconventional, give thought to conventionality. If things are never different, they’re always the same. I agree that your style comes from what you’ re doing wrong. 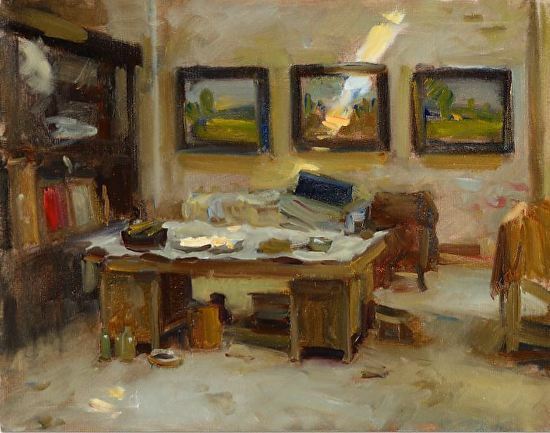 I have been examining Joaquin Sorolla paintings and have noticed that he is capable of doing just about anything but restrains from making everything perfect — and that is the beauty in his paintings. He painted for himself and completed them in a fashion that made him happy. You can see it all through his works. I can almost feel the joy that he felt because of his love of painting. It took me a while to come to this realization, I had to set aside a lot of preconceived notions and be very open-minded. What I might have disregarded as sloppy I now see as emotionally saturated. Yes, yes, yes. I get it. I’ve just spent four years in art school. Every day the message was “Innovate wildly, buck the system, shock and insult our rotten society — even the hand that feeds.” Now I realize that this was a ploy of the instructors who, having for the most part failed in the game themselves, saw fit to foist “attitude” on their hapless students. Some sort of mean punishment for personal disappointment, I think. But I’ve an antidote for the poison. For a while at least, I’m going to join the “get real” human stream, be contrarian to my instructors, and try in my art to communicate the positive and beautiful side of life. Those foxes of conformity and mediocrity stalk us because we are often under some economic pressure and this has been the ruin of a lot of potentially good artists, and also the source of much of our unhappiness. It’s a basic problem that we live with while achieving our daily bread. But I think that the public is gradually educating and evolving and becoming more casual and experimental in their art buying, don’t you? (RG note) I like to believe in progress. Our fellow artists may laugh at this one, but when I read your letter just now, it made me think; “be as free as a chicken.” The reason I say this is because this evening our neighbor brought us over a dozen eggs — very big eggs and probably every one of them are double-yolkers. Our neighbor works for a chicken company where they process chickens and eggs. The eggs he brought us were obviously too big for their cartons so they have to give these eggs away. Anyway, I guess they forgot to tell the chickens not to produce eggs so big that they couldn’t fit in the box, but it wouldn’t have done any good as these chickens are free. But maybe not as free as they thought they might be on the other side of the business by tomorrow — a chicken in the pot. Chicken, Chicken, quite contrary! Last weekend I asked my boss to let me go for the summer so I could finish off my 4th semester at University. Work and school were conflicting way too much. I decided to give up my apartment next month and move home for my 8-month co-op work term. Since I’m in Entrepreneurship, I have the option of running my own business during this time and MAKING SOMETHING HAPPEN. I have decided to do a 100 painting show next May. It will be held on a Saturday night. I have started to look for a building that will hold 100 paintings and a lot of people. When I go home, I will U-brew with my mom to make a few big batches of wine and beer so that I can have drinks and appies for the evening. I’m also going to have a door prize raffle with donations from businesses around town to get people to come. First prize will be an original watercolor. It’s going to be my first solo show ever and I want it to be huge! I want it to be one the biggest, most exciting events of my life. I’m already getting palpitations! When I did paintings for the I.P.E, I was doing 20 paintings a month, so I know I can make the deadline and have room for framing, planning and promotion. I will do 70 watercolors…30 20″x30″ on Arches 300 and 40 15″x20″ sheets. Then I want to have 15 pastels on suede matboard and 15 acrylics in as new style that I’ve been playing with…just to get some feedback. I have friends who play in a Jazz band who will do the music. Anyhow, it’s all still fresh in my mind and I need to work on the details. I like and sometimes do challenging art — visually, technically, subject matter… But you have to be able to live with it in order for people to be around it. I had a funny conversation with a gallery owner last week. He had a show about the objectivization of women… He was a little surprised that it didn’t sell well. I had to ask do people really want to live with this? Not usually. I bought an impressionist painting last week. Very nicely done. Reminded me of Pissaro… Ah well, maybe not a ground-breaking work of art, and therefore maybe never much more than mediocre, but the artist’s will made a sale, the gallery a commission. I’m an emerging wildlife artist and never really thought of myself as doing this whole art thing the proper way. I paint odd scenes, almost still life’s with live animals included. My husband can never see exactly what I’m doing until a piece is finished and then he’s amazed that it worked. I keep saying to him, trust me, it will be great when it’s done. Rudyard Kipling’s quote about being overwhelmed by the tribe was valuable. That’s exactly what it’s like while showing alongside some of the top wildlife artists. My own creativeness scares me when it’s up alongside my mentors. I’m finally understanding that “what I do wrong is indeed my own style.” I didn’t show anyone my work for many years and only displayed in local galleries. Now I’m faced with marketing limited-edition prints and I am learning to become more confident in what I’m trying to express. I had a commission from the McDonald’s Corporation for a new restaurant in Sherwood, Arkansas. The owner wanted 14 paintings, on Masonite, done in acrylic of historical buildings, scenes of the area. He also wanted the dimensions to be 4’ x 4’ square. I tried to talk him out of the square idea, but he was figuring wall space and didn’t have any concept of the horizontal. Getting my compositions to work with this square format was terribly difficult. I haven’t painted in a square format since. For the benefit of my students, I sometimes liken the process of painting and art to that of learning to write. At first we clumsily learn the shapes and structures of each letter, and painstakingly fashion simple and clumsy words. With maturity we learn sentence and paragraph structures and we can say more as we describe our world. More advanced, our writing becomes an art form as we synthesize our world through creative writing in a style that becomes our own. Similar to painting, it is at this stage that we begin access and do “art”, when the skills are second nature, and we can fly a little within our own imaginations, letting our individuality and uniqueness shine through. Finally we arrive at the goal, the signature. It is a stroke of pure “you” barely recognizable in content sometimes, yet speaking volumes about its author. I try to make every stroke of my brush “a signature stroke” which bears all the courage and honesty of my handwritten signature. It’s like a shorthand for what I want to paint. The painting will succeed if I never cover up those signature strokes, but leave them raw and honest on the painting. (How many times have you loved your painting at first, but continued to peck at it and ruined it? It’s because you covered up your original, impulsive and pure signature strokes!) How do you do it? How does it feel when you write your signature? Show me your own personal art. Let me see your signature. I am amazed at the synchronicity that occurs, which Julia Cameron of The Artist’s Way promised. This letter on the contrarian fits the bill. I had at least 4 conversations in the past couple of days about the issue of being different, and how I am now beginning to see it as an asset instead of a weakness. Being yourself, which seems to go hand in hand with being different from the majority can make life less smooth until you see the beauty in that and all the wonder it adds. But at first it seems to cause difficulty as we are all faced with the impositions of society. Living your own life takes courage and clarity as well as the strength not to let judgement interfere. You may be interested to know that artists from all states in the USA, all provinces in Canada, and 85 other countries have visited these sites since January 1, 2001. And Janet Morgan who is not contrary about being artist in residence at Weir Farm National History Site (a National Park) in Connecticut.